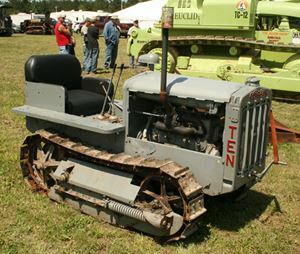 One of the world’s rarest crawler tractors, one of two Avery Track Runner halftrack tractors in existence. 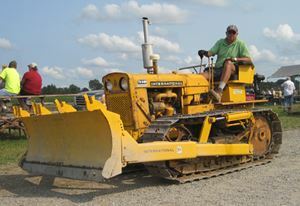 This beautifully restored machine is owned by Ken Avery. Lynn Burdick of Endicott, New York, has been one of our most consistent exhibitors over the past several years, bringing this 1939 Bay City 20 shovel to Conventions from Ohio to Rhode Island. 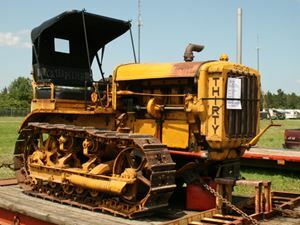 Here’s another rare machine – a Pettibone Mulliken 402 motor grader built in Rome, New York, a hundred miles east of Canandaigua. It’s one of ten machines shown by Scott Carlisle. 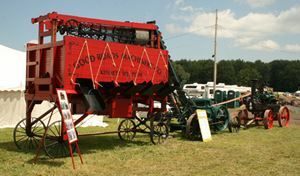 The David Shearns family was another major exhibitor, also with ten machines. 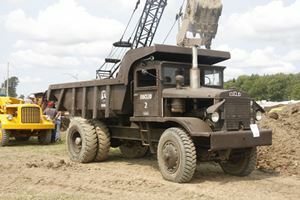 This is their 1929 Cat Ten. 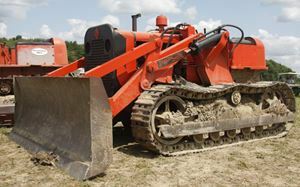 A 1953 Allis-Chalmers HD5G crawler loader equipped with a Tractomotive dozer attachment for its TS5 loader. Walt Carmon is the owner. 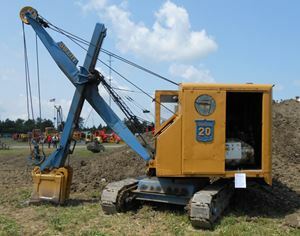 Steve Carmon’s 1940 Bucyrus-Erie 10-B shovel has also been a frequent exhibit at our shows. 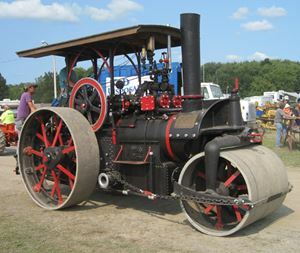 This 1916 Buffalo-Springfield steam three-wheel roller is owned by Randy and Steve Floyd. 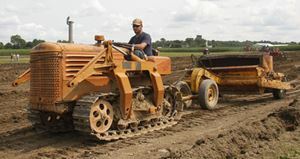 HCEA Second Vice President Bill Annechini at the controls of his 1965 International Harvester TD340 crawler tractor. 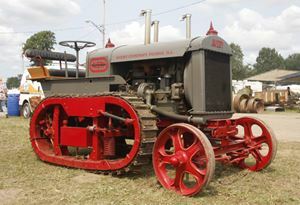 Euclid machinery, including Board Chairman Larry Kotkowski’s 1947 49FD R-15 end dump, was featured at the show. 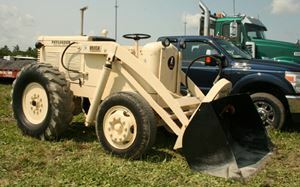 President Charlie Capone owns this 1948 Hough HF Payloader. Registered and photographed before it could be unloaded, Pat Yankelunols’ 1930 Cat Thirty sports a logging canopy – a far cry from today’s EROPS! 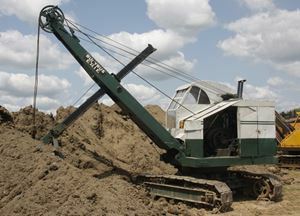 This 1916 Good Roads jaw crusher and trommel screen plant, owned by Gary Tetz, was shown at CONEXPO-CON/AGG 2002. The 1903 Case portable boiler at the right was added to the display since then. 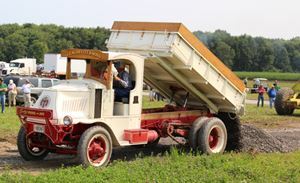 Jack McDevitt’s 1923 Mack AC dump truck got a good workout hauling gravel to the new road. Two visitors to the HCEA area from the NYSEA exhibits, an unidentified Cletrac tractor and hydraulic wheeled scraper. 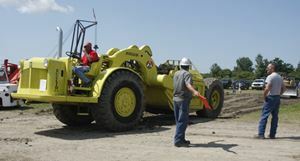 Traffic flagging isn’t in the curriculum of the safety classes that all HCEA show operators must attend and pass! National Director Dave Geis flags for National Director Dean Wack's S7 scraper.